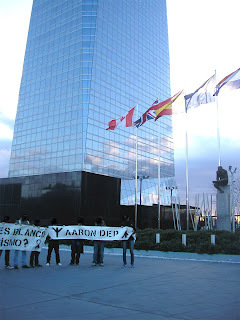 In Spain you can make a concentration without previous request to the authorities if you are a group of 19 persons or less, and it was done in such way to avoid legal problems. 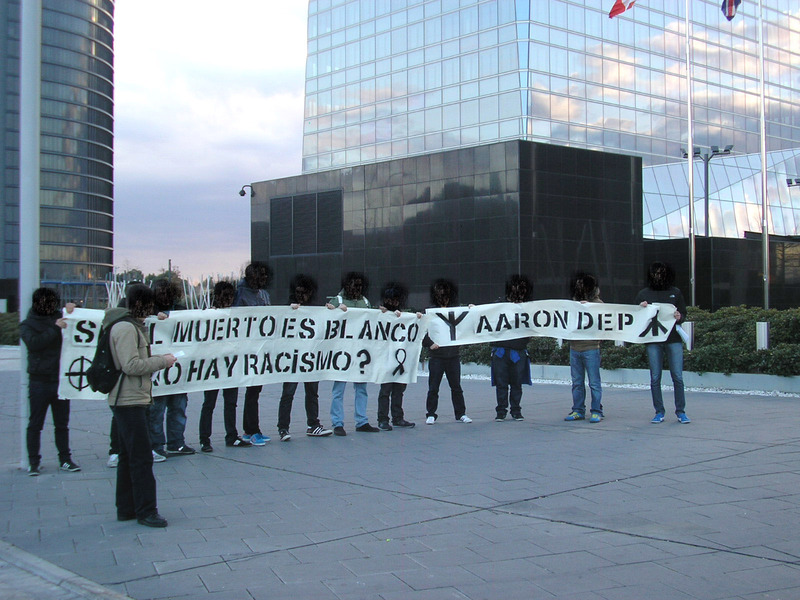 One of the banners said “If the dead is white, there is no racism?” and other “Aaron RIP”, and also leaflets denouncing this case were given to pedestrians. 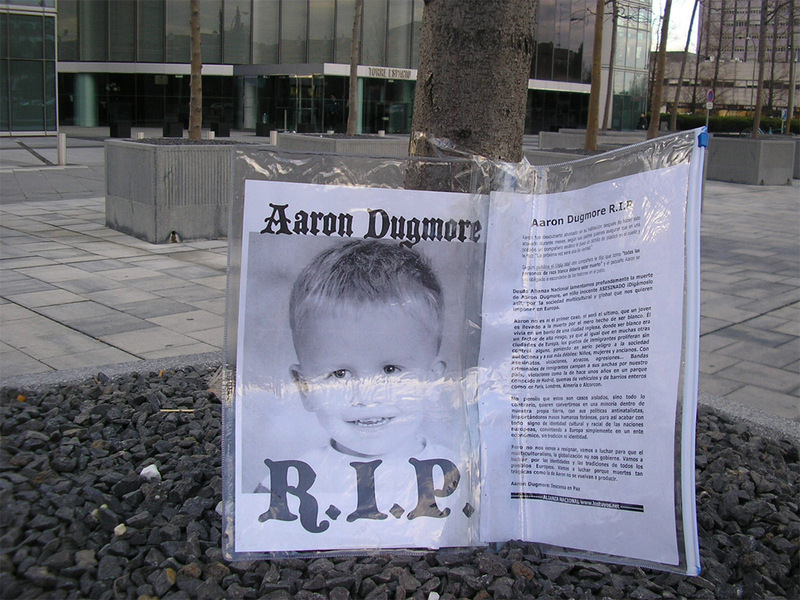 Some days before comrades of the political party Alianza Nacional made a small memorial act and put a photo of Aaron together with a manifesto in a tree in front of the Embassy. Aaron was a normal kid, like our brothers and sisters, cousins, neighbours, sons... an European kid that moved with his family to a new city inside his country and went to the school, tried to have fun as any of our kids, and who probably wanted always to play a little more instead of going to the bed. Probably he liked the cars, dinosaurs, sweets, animals, football... and probably he had fantasies of what he will be as an adult: veterinarian, football player, astronaut, fire-fighter... in a future that he will never have. Maybe he liked a girl, a girl he did not know how to call her attention in other form that pulling her ponytail or teasing him... that girl to who he would never confess that he liked her. 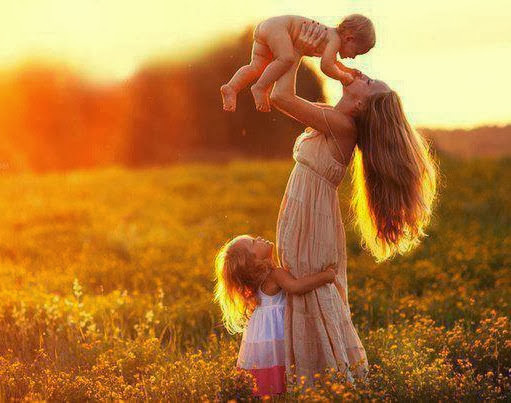 Her fathers would not be worried of when he would become independent, if he will go to University, if they will make him harm, if he will cry, if he will take care going out at night as a teenager, they do not have to worry about anything because the short life of Aaron has finished. His room is empty and so that it will always remain, because he was only a kid, but his infancy has been stolen. His little kid fragility could not bear the continues threats, the continues insults, the continues despises. In the break time he had to hide, because the minority not so minority converted into majority had not stopped to bullying him, chasing him and tormenting him, only for being white, with no action from the school direction or his teachers. He has been made to feel guilty for being what he was, for being in his country, in an English city. He was made guilty for not being an immigrant, as if being it was the only passport to be happy. Aaron was a kid assassinated by the intolerance, and we should not forget that we can all be victims of that. We live in villages, cities, neighbourhoods where each day we see that we know less people and do not know each time more people. Are we going to allow that this painful act became usual? Shall we permit the genocide of Europe? 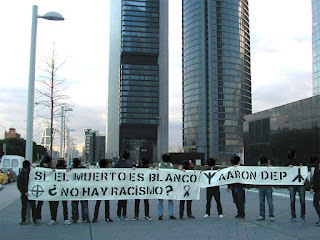 In Madrid some youths said NO, we are not going to permit that they can take away our daughters and sons, neither our fatherland, for this reason we aim to all the Europeans to become aware, to fight everyday for what it is our and do not fall into the "political correctness" waves. Aaron the shine off your smile illuminates us like a star, even though you have smiled for a short time, for us it will be eternal. 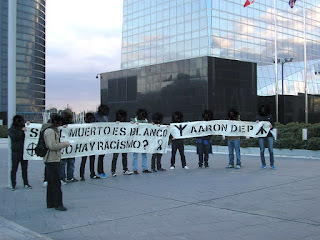 Aaron Dugmore Guilty of Being White. 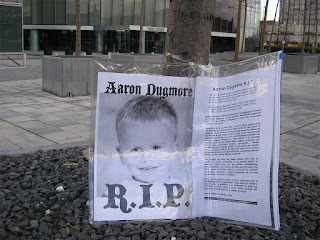 Aaron Dugmore Rest In Peace. Hail our Spanish comrades! 14~88. Exactly, you have right. Here you have been quote one of the latest and very effective data on 14words.net.It is a alternative site for us.We get valuable tips by this site.Always,I like this site. This is very nice post! I will bookmark this blog.As,I want to share I am going to demonstrate you how to make a web page in WordPress in less than 10 min. I will show How to create a website. Wordpress platforms is a free foundation (free) web page designer which you can handle online. You will learn how Easy it is to set up WordPress, along with simple guidelines on "How to make some primary options in WordPress." But first, you will need to make web host with HostGator. In it clip I have defined this detailed.